Busy, busy, busy...., hence I have not had time to blog regularly. Not much time to visit new places except tried and tested places, like this favourite spot - Country Farm Organics. I can imagine, everyone going, errrr? nice ah, this kinda food? Strangely enough - it is, extremely tasty stuff. I often call this place, my comfort place since they serve affordable and delicious food. 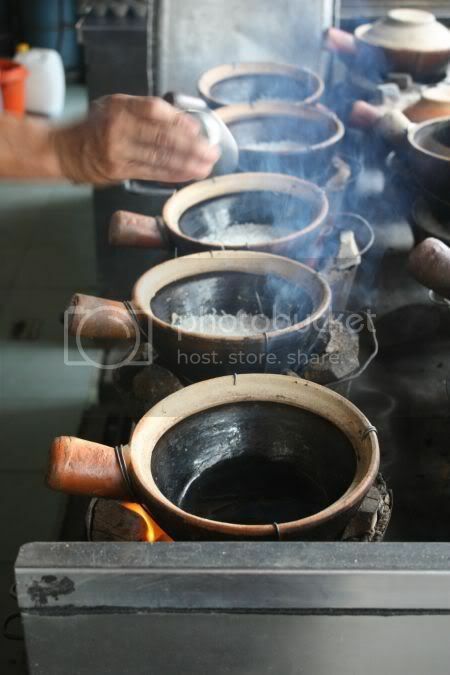 They employ slow cook techniques where they make an effort not to overheat and overcook the food till the natural enzymes are destroyed. 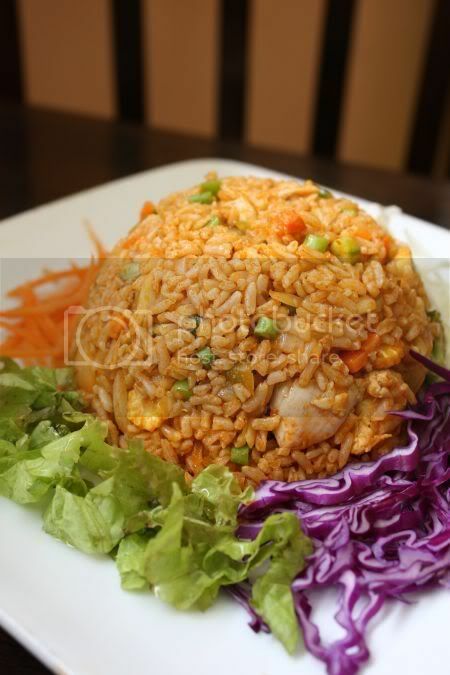 Our all-time favourite is the Beta Carotene Fried Rice with tomato puree and lots of vegetables. It is usually Splashie Boy and my mother's must-have item here. However, do note that not all items taste great nor appeals to the general public, as some claim it taste "too healthy". 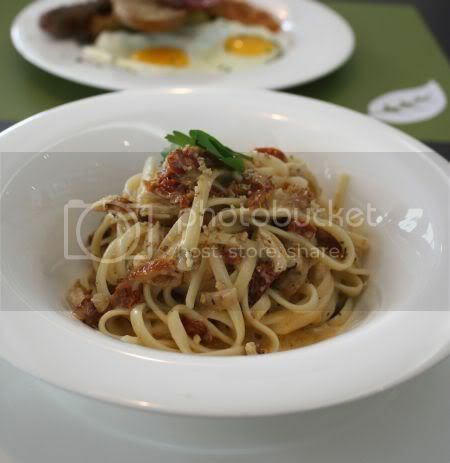 I usually go for noodles - the dory fish noodles. Tastes like the fish head noodles with a milky broth but they give you boneless dory fish cubes. Other favourites include the fried noodles, the tomyam pasta and the pumpkin soup. Fatboybakes, another fan of this place swears by the bittergourd soup to cure hangovers. 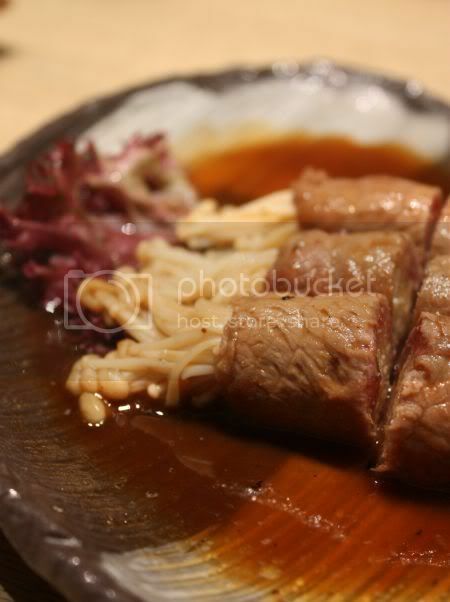 Usually whenever we order these one plate items, I'll add a cooked vegetable dish. For our late lunch on Sunday, we decided to try the spinach, cooked cantonese style with wolfberries and egg. Yummy stuff - but sorry no picture. Prices are also pretty reasonable especially for the Bangsar area - about RM8.90 for the fried rice and if you subscribe to the membership card, you get a 15% discount. You also get discounts with the membership card, if you purchase goods from the shop. Although they have an outlet in 1 Utama, I generally prefer the outlet at Bangsar instead. 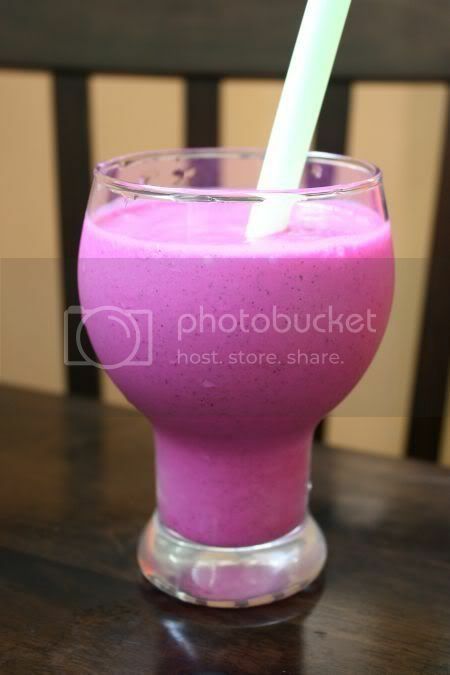 Do give it a try but be patient, especially during lunch and dinnertime, as it can get quite packed also with people. Disclaimer: The opinions expressed here is entirely based on my personal tastebuds and may vary for others. The reviewer also declares that she has not received any monetary or non-monetary compensation from the restaurant for writing this review. Thus an eventful weekend - the title kinda sums it all up. Saturday was one of friends from college's wedding (well, kinda since technically it is her cousin, who studied with me for school, college and university). A beautiful wedding, the ceremony was held at sunset next to the lake at Saujana. It was good catching up with old friends and the wedding had a little twist in it - the hustle which the bride, groom and entourage did down the red carpet. For more pictures of the wedding, taken mainly by Splashie Boy, see my flickr set. However, our dinner was a bit too exciting for both of us. Just before dinner, Splashie Boy made a remark about how the last time, he ate at that particular place, he got a really bad allergy attack. Just at the end of the dinner, the symptoms started - teary red eyes, red ears, trouble breathing and puffy eyes; all signifying the signs of a very bad allergy attack. Hence it was to the nearest hospital - SJMC's emergency ward under the advice of Splashie Boy's uncle, who works there. It was good we went in, as he got looked after quickly - a jab, tablets, eye drops and even a nebulizer since they were worried about his breathing. By morning, he looked like normal and not some beast from the underworld with his puffed up eyes. He still has to be on medication for at least 3 days to clear the whole attack. It was still an eventful weekend - we had to deal with house alarms going off in the middle of the afternoon and putting up the kittens for adoption (a traumatic experience, I hope they get good homes!). 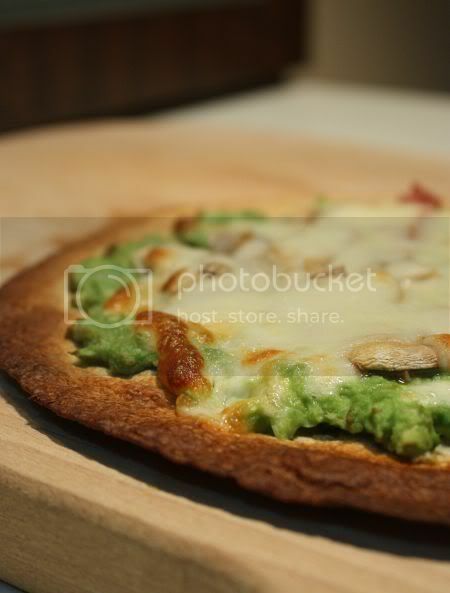 Hence dinner, was something we recently discovered - the easiest ever pizza, done in 5 minutes. No hassles with making your own pizza dough, letting it rest and etc. Just grab a packet of tortillas from Giant or Cold Storage, chuck your favourite ingredients on top and place in a preheated oven of 200C, wait till all the cheese melts and the sides of your tortilla browns and you have crisp thin pizza! I've been experimenting with a few flavours - starting out with the basic tomato one, with tomato puree, mozzarella cheese (don't it remind you of rubber!?) and fresh button mushrooms. Not one of my favourites, hence I made a quick basil pesto and spread it on top and I fell in love with those flavours. That gave the extra edge the pizza needed. The first batch, I even topped it with egg, that cooked slowly in the oven, hence you got a soft yolk on top, that coated the pizza, when you broke the yolk. Yum!! My latest invention - just mash avocados and mix with chopped onion (an impromtu guacamole without any lime or lemon juice, as I had none!) and top it with fresh button mushrooms, beef salami and mozzarella cheese with a bit of blue cheese for flavour. 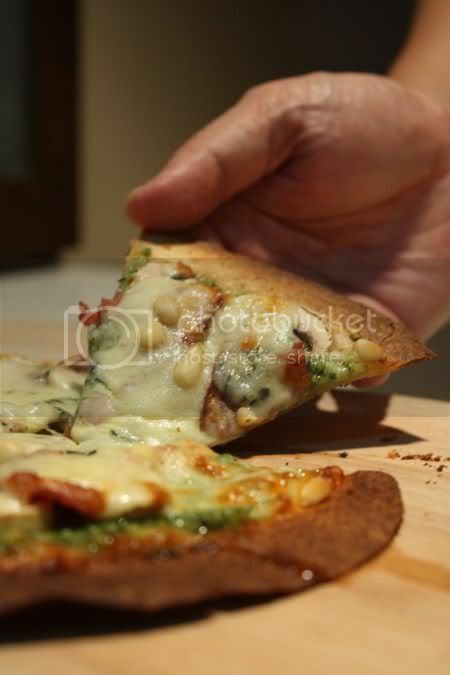 Sprinkle with pine nuts, and it tastes simply superb. Eat it quickly from the oven as it can get cold quickly. 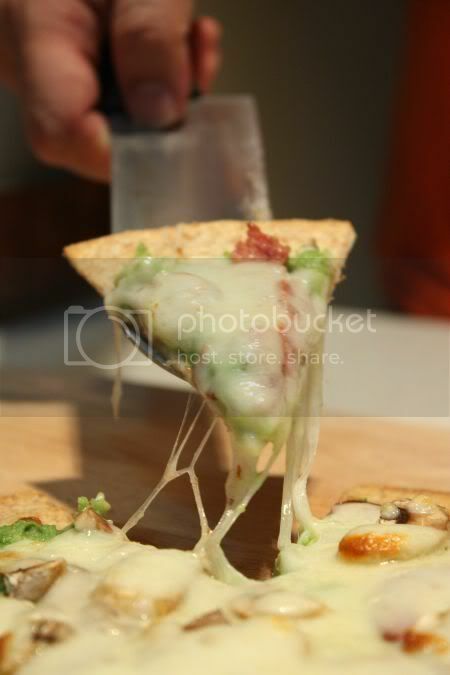 Just grab a packet of tortillas and experiment at home with your favourite toppings. 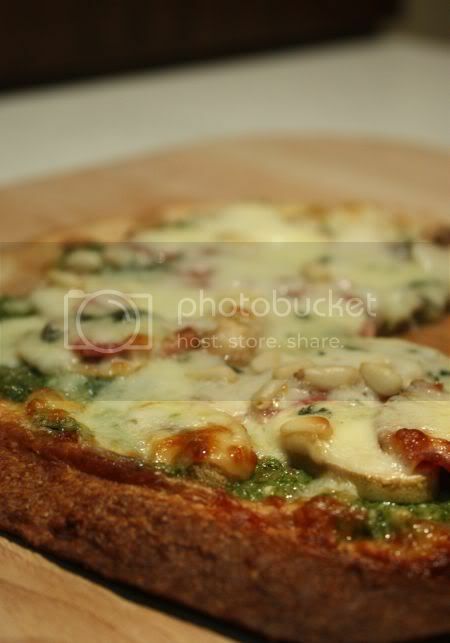 You won't regret it as it is definitely the best ever pizza. There are a few flavours of tortilla - plain, wholemeal, garlic and etc. I had abandoned the blog for a while, since I was busy last week. Hence, I only got to hear about the tragedy, after the weekend is almost over. While, I didn't know Sher from What Did You Eat?, especially since she was at the other side of the world, we connected purely because, Upsie her cat bore a striking resemblance to my calico cat, Chiko. It is sad to hear about her death. While, I can't make any of her wonderful recipes as a rembrance, I do give you Ally Cat's picture, who is all pensive and thoughtful, especially after these news. In terms of kitty matters, life has not been too good for us either (a reason why I stopped blogging on WCB), as we lost quite a few members, who crossed over to kitty heaven - mainly due to doggie mishaps, illness and etc. 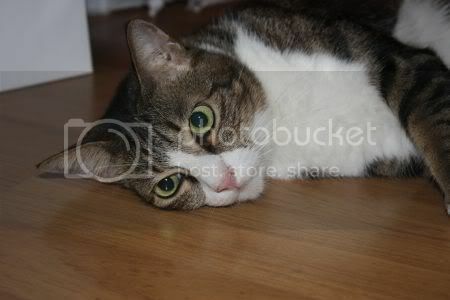 Even Chiko, the cat who looks so much like Upsie, left us recently as she had cancer. Thanks to Astrid, from Paulchen's Foodblog for organising this event, to remember Sher. I'll always remember her, the wonderful food blog she had and her compassion for her kitties and the squirrels she took in. Since it was a rainy day, I wanted something warm and comforting for my tummy to get me through the day. 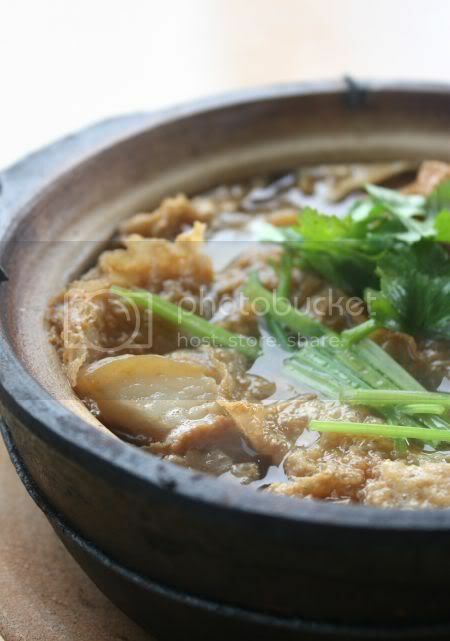 Hence, I turned to the nearest and best thing I can think of - claypot bak kut teh. Just a few minutes away from the office, through a small little road packed with cars and trailers heading towards Subang New Village, is bak kut teh heaven. There's about 3 bak kut teh places around a small area - at the shophouses and this particular one housed in a wooden shack, right next to that busy road. Crossing the busy road (even with a car) can be quite a nightmare but put your signal and hope the traffic light up front quickly changes to red. While this is the most popular outlet, there is very little choice here - only various cuts of meat in your bak kut teh (no spare parts, mushrooms and etc), served in a piping hot claypot. Even though the soup is not as fantastic compared to my favourite Teluk Pulai shop in Taman Rasau, it is still very warm and comforting. If you prefer, they do also serve vegetables, assam fish and vinegared pork trotters. Place gets packed for lunch and everyone will haphazardly double park around the wooden shack. Are food quality standards in jeopardy??? No food review today, but I thought I would like to bring up a topic that has been bugging me for some time. An incident during the weekend, when the issue reared up again, just brought to my mind, how food quality standards seem to me dropping drastically. It's not a random incident, as I have been noticing how places, I love to hang out before - the food don't taste the same anymore. I reckon it is the rising prices, as everything has gone up double or even triple fold. Take for instance, butter. The price for my favourite brand, Lurpak has risen to almost RM10 a packet, almost double from before. Makes you rethink baking a cake, nowadays. I've heard of stories about restaurants that can't be bothered to make proper stocks anymore, as it is just way too expensive. Imagine how much more they will save if they add a pinch of MSG versus adding an extra chicken. Most of these places, don't dare increase prices, as consumers will just run off to another restaurant, hence shortcuts like these are employed instead. Whatever it is, we the customers end up suffering instead. For today, let us share bad experiences we had at restaurants or even street food places, we always thought we could rely on. I reckon, we need to start a consumer food watch index soon, as standards keep dropping. Maybe it is time to start cooking at home, where we are guaranteed good food. One of my fondest food memories as a teenager, was the introduction of London's food scene. To my uneducated palate, it was a whirlwind of flavours - starting from the first time I ate a full course Greek meal (believe me, the food and the partying never stops with a Greek meal), dug into babyback ribs and ate crispy onion loaf at the Chicago Rib Shack (incidentally, isn't it amazing the rib shack is back in London!) 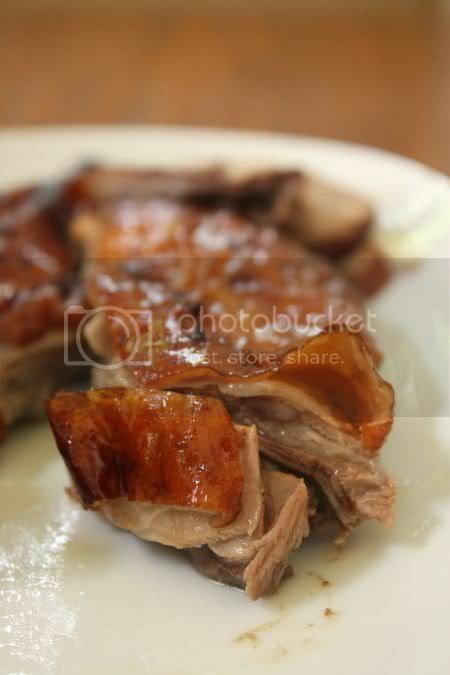 and of course, tasted the iconic roast duck from Four Seasons at Bayswater. It was definitely the juiciest and yummiest ever roast duck, I tasted. Not sure what was the secret? Were the ducks bigger and better?? ?, I used to ponder. Whenever, I visited London, during my student days and even when I became an adult, dining at the Four Seasons was a ritual, I followed religiously. In fact, the last time I visited London, on the way back from Chicago, I made my pilgrimage to Bayswater and packed back a whole roast duck to share with my friends. Hence, when I heard through the grapevine last year, Four Seasons was opening an outlet here, I was flabbergasted. How, can it taste the same? since the ducks will be local ones. I do remember someone telling me a long time ago that ducks from the overseas are banned in Malaysia. Anyway, I waited and waited as construction delays pushed the completion of the shopping mall to middle of this year. Finally, someone told me the place was opened, hence I knew I had to check it out on my day off. Located in a very obscure place, Capsquare - I call it obscure as the place may be big and snazzy but it is kinda dead (imagine super empty Coffeebean and Tea Leaf and Starbucks plus the Times Bookshop doesn't even open on Saturday!). I guess the mall will cater to the residents of Capsquare Residences. To be fair, loads of places have yet to be opened but still even though it comes complete with coffee and flicks from GSC, I don't think it's going to be as packed as Pavilion or Suria KLCC. The decor of the place is nothing to shout about - just a modern Chinese place with no Chinese motifs, with not a customer in sight but luckily, there were roast ducks hanging from the open kitchen. Not wanting to alert the people, I decided to pack back my roast duck. By the way, service was kinda reminscent of London - the "I don't care you are the customer" attitude was also showing even when I placed my order. 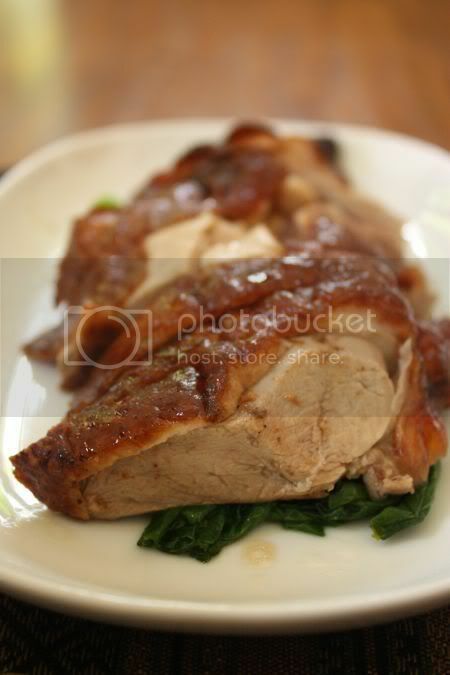 I also threw in with great measure, an order of roast pork. 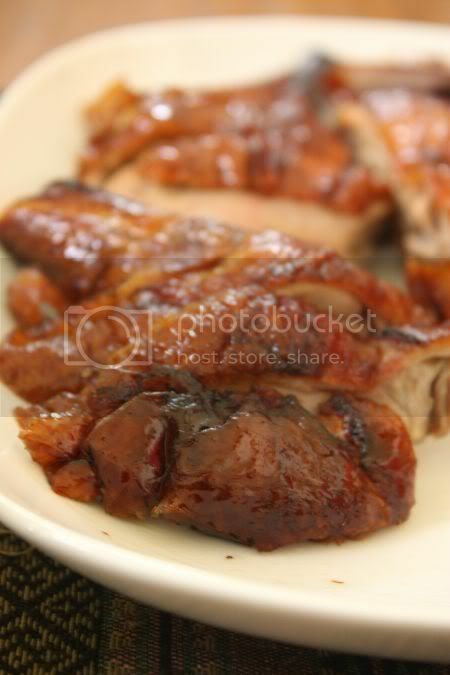 They also had char siu, guai fei chicken, soy braised chicken, pork ribs but I decided to try the roast duck. Once I got home, I got a little accquainted with my roast duck, moving it around in a few angles, to shoot the feathered fella in its glory. Hmmmm, doesn't look very impressive, through my viewfinder. Maybe my memories must be failing me. I mean, it has been almost 10 years since I last ate it. Feeling slightly dissapointed with its look, I decided to share my stash with my mother. At times like this, (when usually memories always cloud your judgement, it is best to have a second opinion). A bite of the first piece revealed that looks were deceiving. 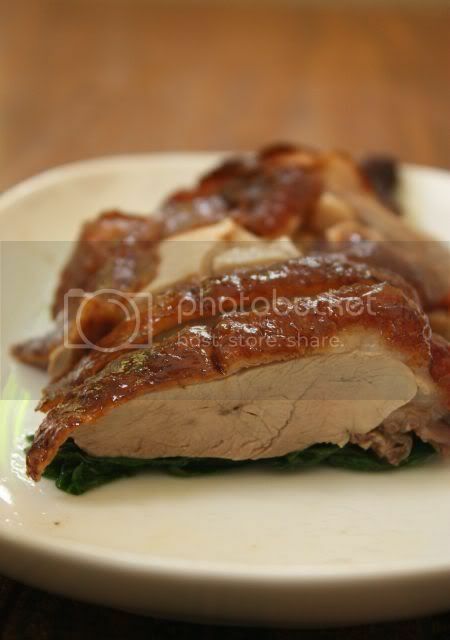 It may not have crispy skin but it the most juiciest and superbly tender duck I have tasted here. We both used our fingers, as it was the best way to savour the food - simply finger licking stuff. Not sure what's the secret but the meat was so good, we ended up eating half of the duck between two of us!!!! Incidentally, to fully enjoy your meal, eat it just plain without any sauce. If you have any leftovers (a big if! 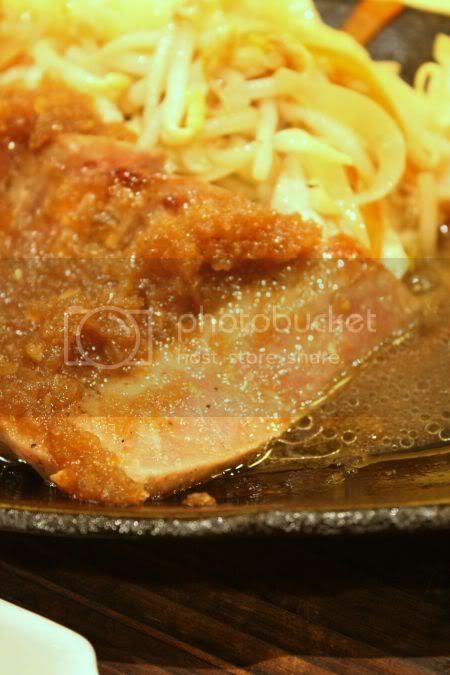 ), use that sauce to fry the duck, as that goes so well together. 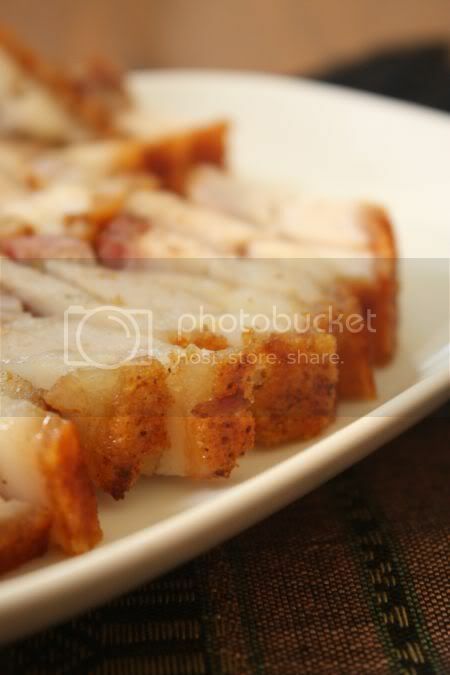 However, the roast pork was a big no-no, a quick taste of it revealed too thin slices, not crisp skin and no melt in the fat situation. Robert Wong's melt in the mouth with crisp skin siu yoke over in Pudu, wins hands down - no contender here at all! While, I truly loved the roast duck, I'm not too sure if others will be as enthusiastic about it as I am. I'm sure, everyone will be saying I can get the same duck in my own roast duck shop near my house, at cheaper prices. I guess that could be true but somehow for me, this particular roast duck, rules my tummy and all those sweet memories I have for London. 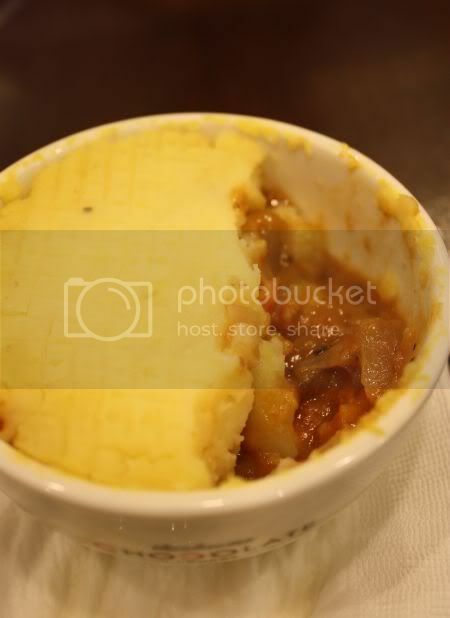 Remember how I blogged about this up and coming place in 1 Utama, Theobroma. Well, it has finally opened its doors to public, hence we did a detour there recently. Incidentally, does anyone know what happened to Bakerzin???? The outlet in 1 Utama has been renamed Oriels. It looks like they serve the similar food. Did they have a dispute with the owner in Singapore hence the Msian franchise holder parted ways? Heard the Bangsar Village outlet has also been renamed. Do have a look at the detailed analysis Cyberdurian offers on why the franchise deal went pear-shaped. Anyway, back to chocolate, a great way to perk up your week especially when you have been faced with the computer screen the whole week. Maybe, I put a bit too high expectations on this place as it didn't "wow" me as much. While the tagline is, "you can taste the difference", I reckon this is true in terms of their chocolate drinks. Not too sure about the desserts, as I felt they were kinda mediocre. Maybe I should try more items on their menu. Let's start with the savoury stuff - not an extensive selection BUT then, it is a chocolate lounge and not a restaurant. There's savoury crepes, quiches, pies and salads on offer. Splashie Boy had the shepherd's pie, which was made with minced lamb (a surprise as most places offer minced beef versus the lamb and genuine version). While the filling was very tasty, I felt they weren't generous with the meat as it had too much onions instead. Maybe that is the reason why the filling was so darn tasty. It was a bit too salty for my liking too. 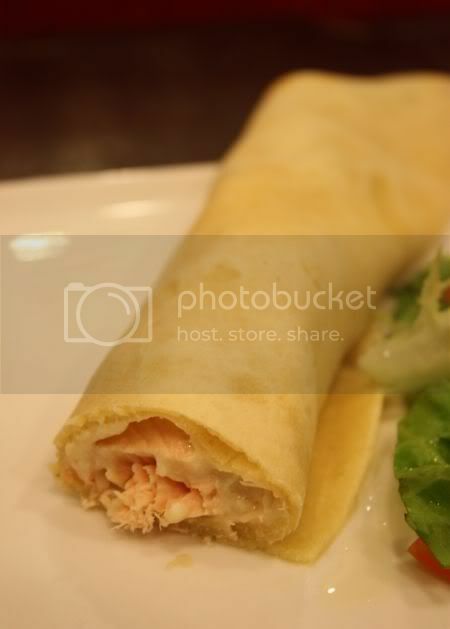 My Scandinavian Salmon crepe was pretty good, filled with chunks of salmon, canned button mushroooms in a creamy sauce. Both items were served with a nice crunchy and fresh side salad. One big gripe about this place though are the super small platters they serve their food on. My longish crepe, was creeping out of its plate....not a very pleasant sight, hence I cut it all off before I snapped the picture. 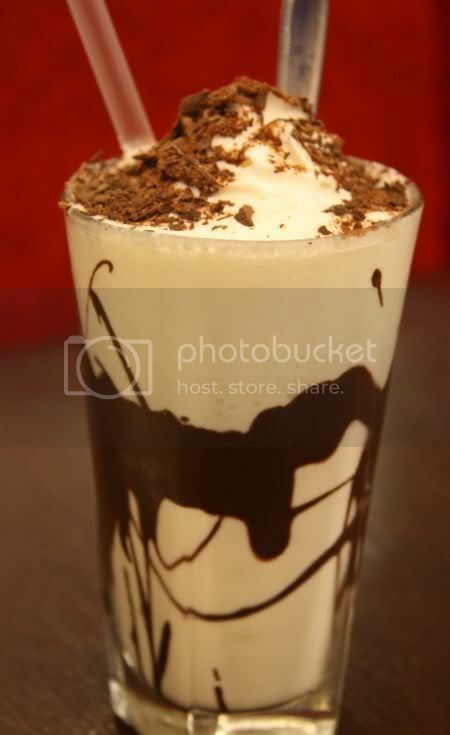 Loads of drinks available - iced blended, iced chocolate and warm chocolate drinks. 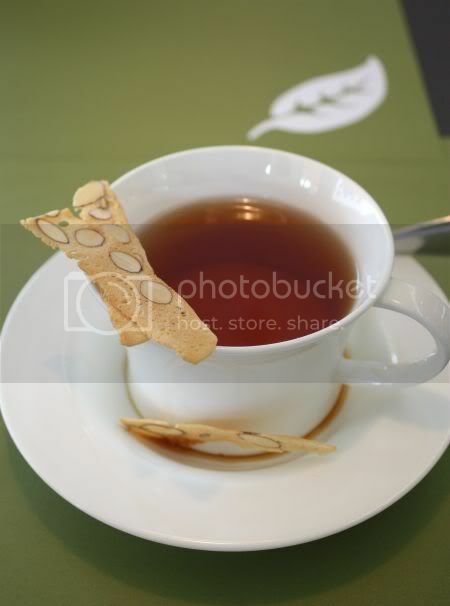 There's also coffee and specialty teas served here. We went for one iced blended chocolate drink - the Snow White Frappe. Made with white chocolate and topped with a generous chocolate shavings, we both enjoyed it. Another gripe about it, while the decor on the glass was pretty, it wasn't edible as the chocolate had hardened on the glass, making it next to impossible to eat it. I had a hot drink - the Ms Coco, a dark chocolate concoction. You get a choice to have it in a mug or in a mug with a warmer for an extra RM3 (it's for the tealight, I guess?). Very yummy stuff, and I liked how my drink was kept nice and warm so the chocolate could melt and not stick to the bottom like other chocolate drinks. It took us a while to decide on desserts as the choices were limited to the chocolate fondue for 2 persons (about RM25, which is the second most expensive item on the menu), chocolate strudel, chocolate croissant, chocolate dipped strawberries and etc. 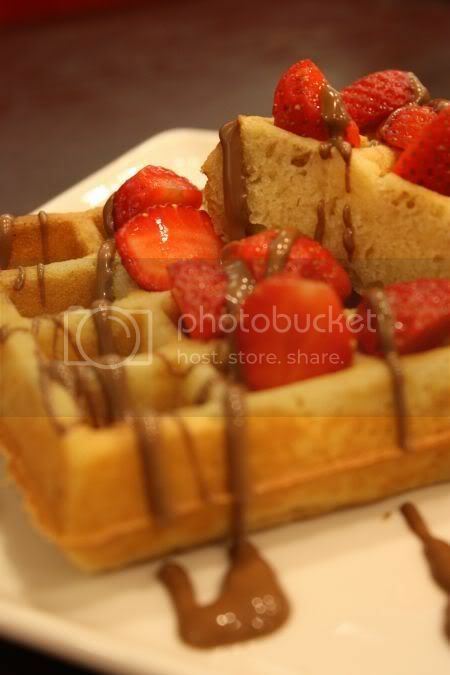 We finally settled on the Belgian waffle, which was served with strawberries and drizzled with milk chocolate. Guess too much hype about this, as it didn't taste extraordinary. While it may have beaten A&W in the waffle taste stakes, this one failed miserably for both of us, as it lacked the extra oomph. Must be the okay tasting milk chocolate and slightly sour strawberries (I suspect they used tiny Cameron Highlands strawberries. A tip for them, sprinkle some sugar to draw out the sweetness as those local berries are more tangy vs sweet) that didn't impress us at all. I reckon I'll return for the drinks but maybe not the dessert unless I have a few people to share the chocolate fondue with. They also sell chocolates - a variety of them in different shapes, flavours and colours. 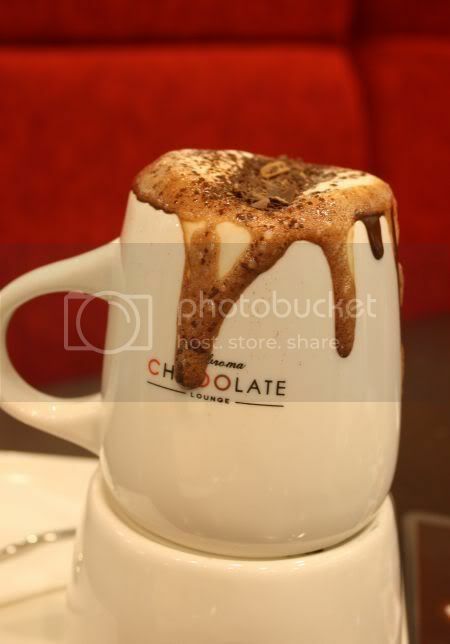 Oh, and for those who love the chili and chocolate flavour combination, they also have that in a drink. There are also plain chocolate bars, and some with nuts in them. Prices are nett, and you have to place your orders and pay first, at the counters. A privilege card is also available for RM10, where you get to accumulate points for special privileges like free gifts, special offers and etc. Something very short today as I just heard the police has set up roadblocks again, hence I better start my day much earlier. No time to reply comments yet, very sorry! Hope we all don't have a frustrating day today. Not sure, if all of you know of the addition of chicken wings to Ikea's menu. It is something I saw a few years back in Singapore's Ikea but it took a long time to emerge here (about 5 plus years). Not sure why the delay as the deep fried chicken wings are super yummy stuff. They can't beat Wong Ah Wah's smoky bbq chicken wings, which remains my ultimate chicken wings but these are great for a snack after shopping in Ikea. Pricewise, you get 5 pieces for RM9.80 and I think 2 pieces for RM3 (around that price as I seem to be having a memory like a sieve today). Must be the in thing to eat at Ikea as I saw a plate of chicken wings on everyone's table when I dined there a week ago. 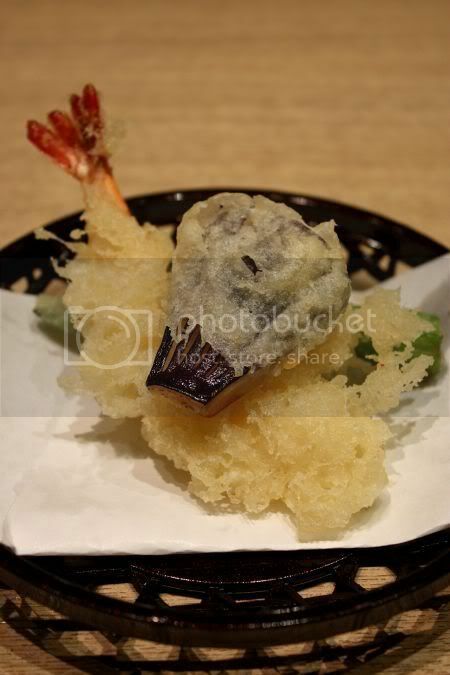 I've blogged about Sushi Zanmai before, at their first outlet - Sunway Pyramid. 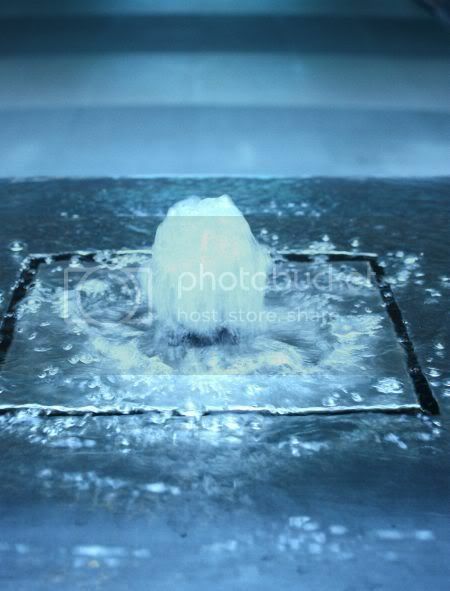 This is their second outlet, which remains super popular with everyone. Another new place is at 1 Utama. We were at the Gardens for a bout of shopping. Checked out the Robinsons sale but nothing exciting at all. Was assessing some outlets at the Gardens - some looked pitifully empty while others were packed with people like Din Tai Fung, Fong Lye and this place, Sushi Zanmai. No prices as Splashie Boy misplaced the receipt! but it was all pretty reasonable even though we ordered quite a lot of items. Service was a bit slow but we got our items pretty quickly once we placed the orders. There was one mess up - they served me Tsukune Soba vs Tenzaru Soba but the lady who served us came up and apologised for the mess up. I thought that was good and extremely professional of her. 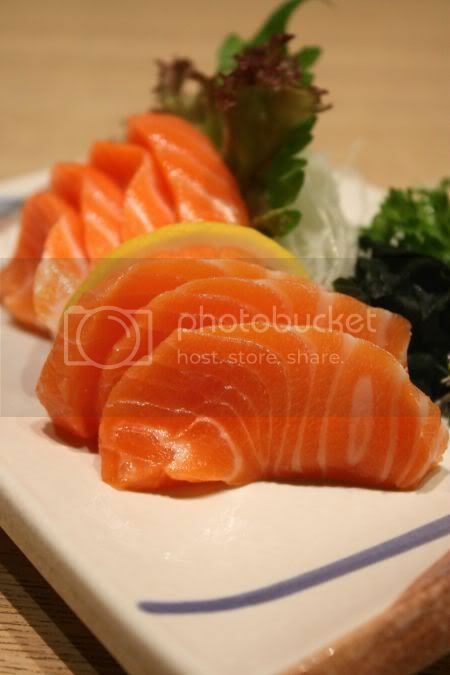 We ordered the usual favourites - salmon sashimi for my mother and her absolute favourite - the Saba Shioyaki. Takes a while for the grilled fish to arrive as they need to take time to grill it but it's nice and juicy, hence worth the wait. 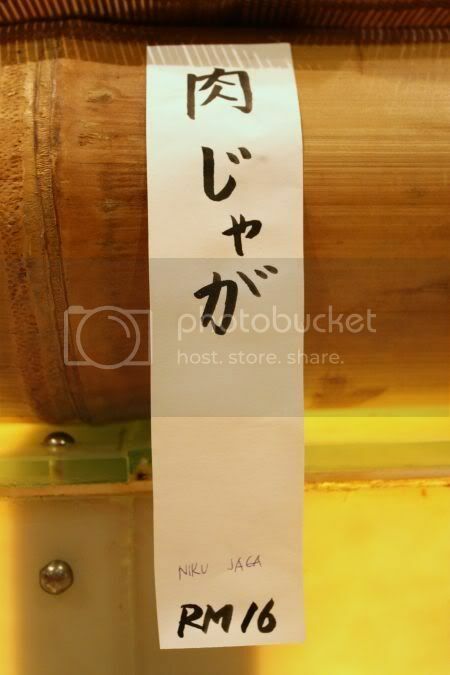 Other favourites were the Gyuniku Enoki Rolls. 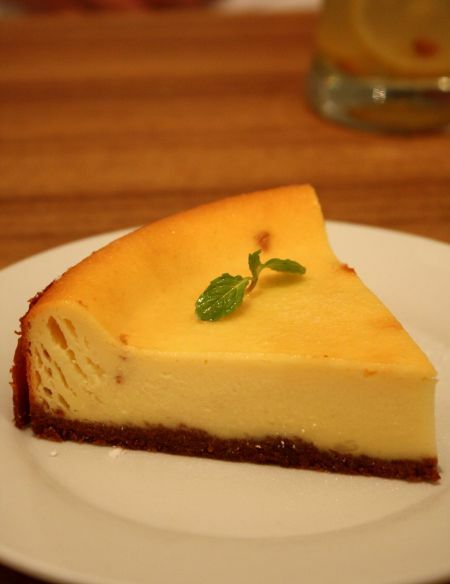 It looked better in Sunway Pyramid plus they didn't slice them into half like here. 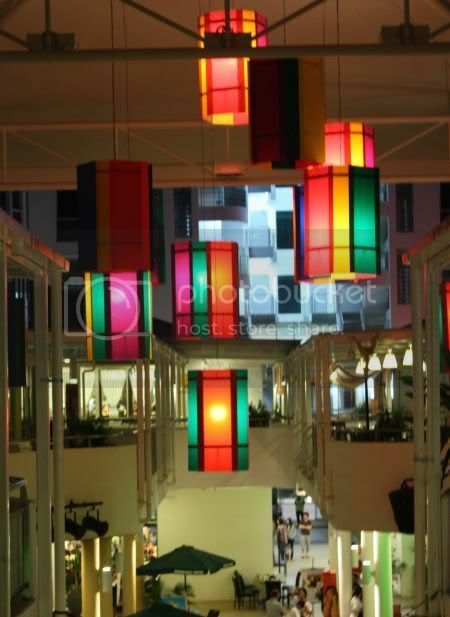 Tastewise, it was also better in Sunway Pyramid. 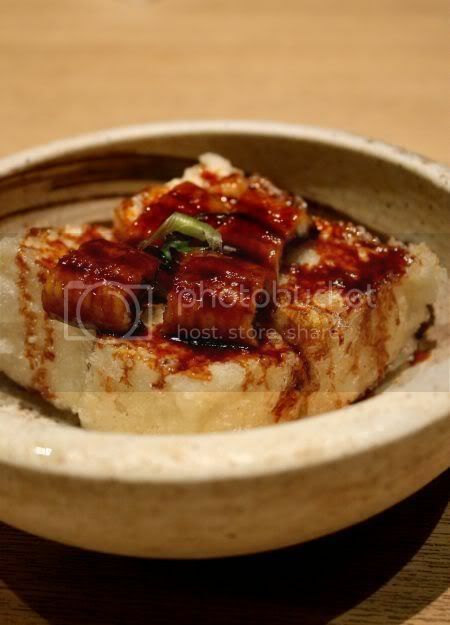 New favourites here were the Unagi Tofu - it is basically agedashi tofu topped with unagi and a bit of the sweet sauce. 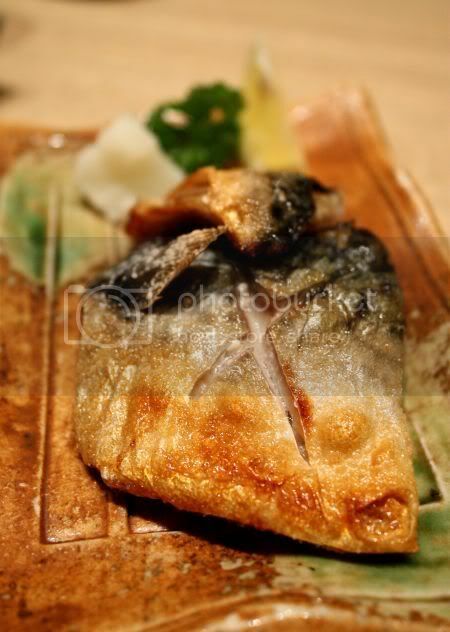 I love that dish and it is always a must-have for me, when I dine here as I love the combination of soft tofu with the slightly sweet unagi. 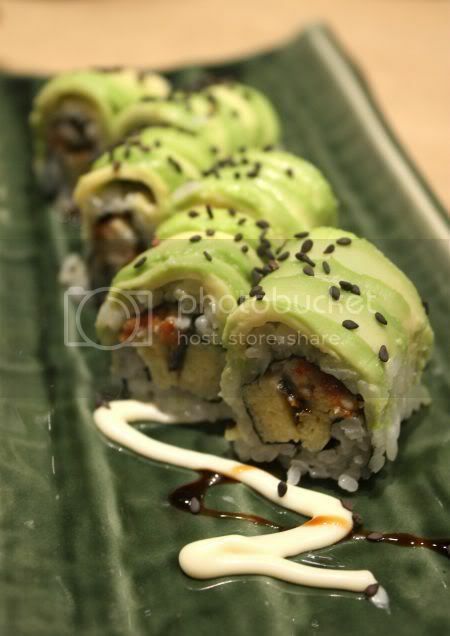 Even the maki was exceptionally good - with melt in the mouth creamy avocado slices topping it. I can't remember what we ordered but I reckon it is the same one we featured before. 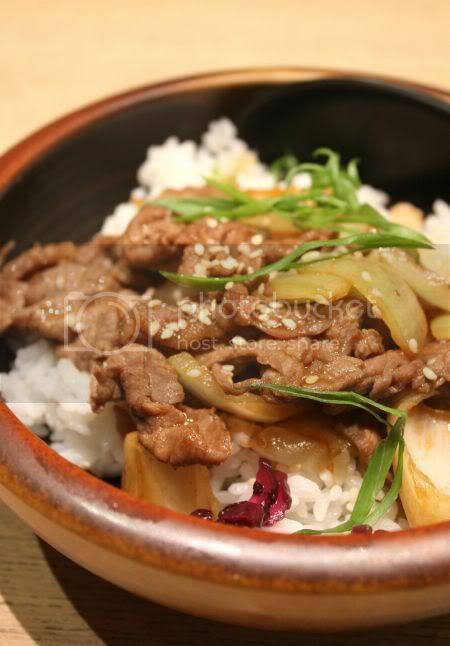 Splashie Boy's tiny gyudon was a good way to fill up the tummy but leave some room for all the extra food we had ordered. I finally got my cold soba with the crispy tempura. 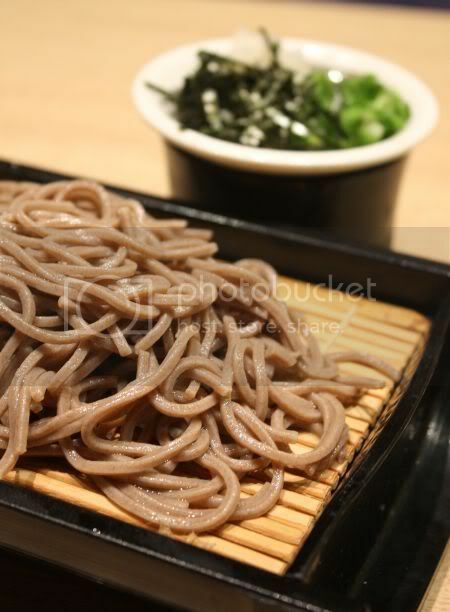 Not as good as freshly made soba from Kampachi but still a very decent meal. Overall, it was a pleasant meal and I'll definitely return here when I am at the Gardens. Yesterday was a nightmare - first it was super jammed everywhere because of the roadblocks. I was stuck on Federal Highway and then my car's radiator decided to give up on me. Luckily I managed to park at the side. Loads of people were also waiting out the queue and some of them were very nice to help out with my radiator problem. Thank god, the highway authorities let people make u turns hence I did get to work. I got my car fixed up too, so hopefully today is much better. Did I tell you all that Splashie Boy loves Tex-Mex food? He once ate tacos for the whole summer from Taco Bell, during his university days - he calls it his official summer food. I read about this new place at Jaya One serving Tex-Mex food hence we headed there last weekend. Only some places at Jaya One seem to be packed - Overseas Restaurant and Ducking. The other places seem to be doing okay only, with one two tables occupied. 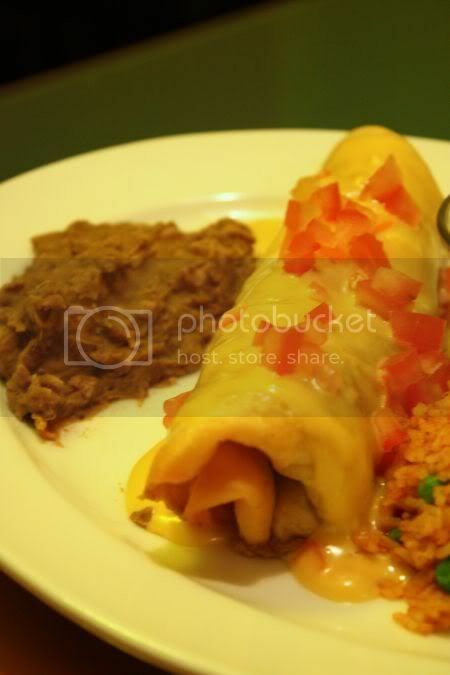 Tucked at the far end of the "bungalows" of Palm Square, is Frontera that is run by a friendly American, Larry Martin who used to run the hotdog stand at Hartamas Square. Splashie Boy's mouth was salivating after he read the menu - all his favourite foods. He ordered with the help from the restaurant people. Great service here, very nice and friendly. We started out with Taquitos de Pollo, the starter. The cute rolls are actually corn tortillas stuffed with chicken and deep fried. Served with a tangy salsa verde and sour cream, they were yummy. Hard to resist, we quickly finished them. Splashie Boy had the chimichanga while I had the enchiladas. 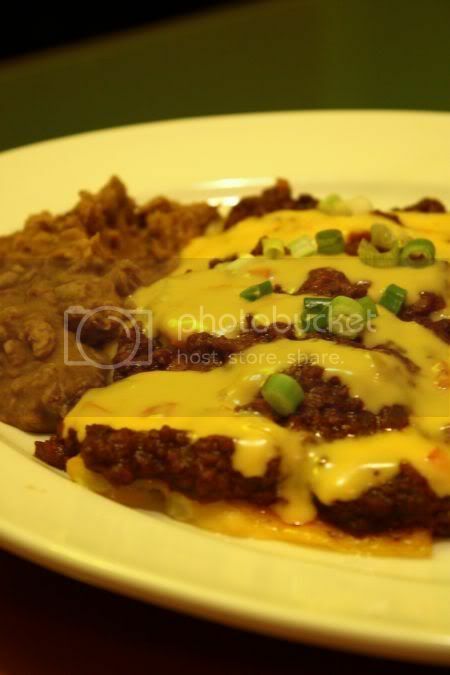 They serve the main meals with a portion of Mexican rice (slightly tinged orange with peas mixed in it), a spicy tomato salsa and refried beans. Those refried beans (a classic Mexican dish) was excellent. What we like about this place is everything tastes homemade. Splashie Boy loved his chimichanga stuffed with beef - he claims it is the best ever he had in town. He wasn't too enthusiastic about my enchiladas, as he said there was a slight spiciness to it but I liked it especially with the layer of cheese on top. Other recommended dishes are the ribs and chili con carne, which we will return for soon. 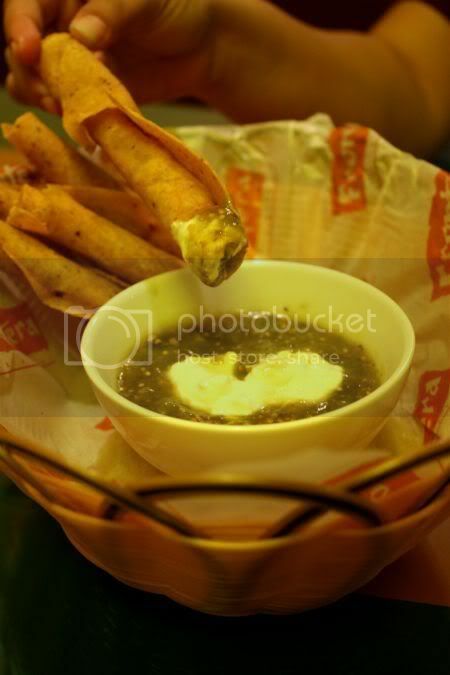 Do give this place a try, especially if you love Tex-Mex food. I heard the margaritas are super wicked here too, so it will be perfect to chill out after work. A very quick post, as I am super late for work. Apologies as I have loads of pictures, but no time to edit them. 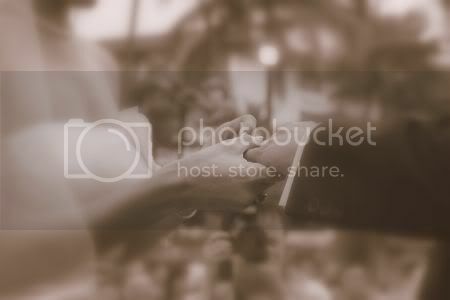 Worst, I just discovered my Photobucket account is giving me problems today. Must track them and find out why..., in the meantime, sorry for those who can't view Flickr, but these pixs are from Flickr. We had dinner last week at Jaya One. Not all the places seem to be packed with people (some outlets looked barely surviving). Everyone was heading towards Ducking! In fact, queues of people waiting for a table were starting to build up when we left the place at Jaya One. I'll post about what we had for dinner, tomorrow, but since that has more pictures and explaination, I'll start with dessert first. Read about this cafe from other bloggers, hence I was curious to give it a try. The menu has a picture of an onion (strangely looked like a Japanese book, I have seen before in Kinokuniya before). Nice cafe with a simple clean look - white blinds, wood laminated tables, white chairs and big clear lightbulbs. Menu is kinda mish mash - Japanese items like Tonkatsu, Onsen Tamago, mixed with local stuff like Char Siew Pizza, Char Siew Lam Mee and etc. Lots of focus on the menu were given to set lunches, guess this place caters for the busy executives, as it was quite empty also. Couldn't remember the recommendations, of the bloggers hence I ordered the cheesecake and rich choco pudding. They didn't give me a nice slice of the choco pudding (more like half of the portion, I see on other bloggers!) but nevertheless, it was excellent. 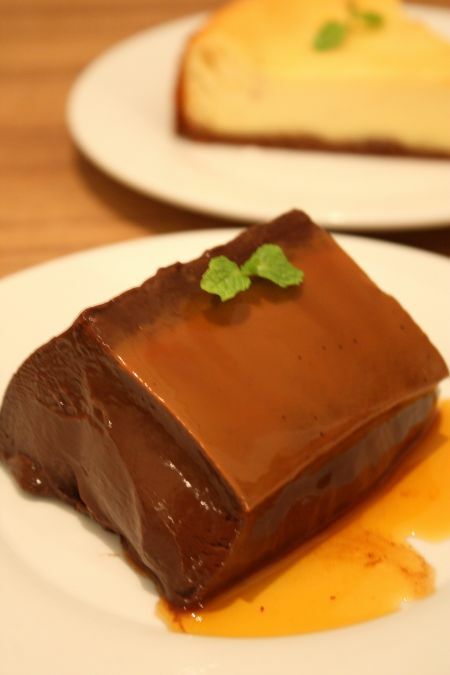 Reminds me of a smooth chocolate mousse - very light with no air bubbles inside. Nice stuff, which got our vote for the night. The cheesecake, I was not too happy with - no taste of cheese at all! Guess I should have ordered the pumpkin cream, others were raving for. Never mind, guess we will be back to try that. One day, on a lazy dazy Sunday, we stumbled upon this small cafe, just round the corner from Yut Kee, Jalan Dang Wangi. Tucked very much in the corner, the place was in total contrast to Jalan Dang Wangi's old shophouses - all modern but somewhat cosy since it was quite tiny. However on that day, it was closed even though it looked tantalising ready. We peeked through glass windows and loved what we saw - nice comfy white leather booths, mirrors with writing from friends, a long dark wood bar, an outside kitchen and etc. Even the name was fascinating - Pink Sage, which we found out later referred to a wildflower. I got on the 3G network straight away to google about the place, but sadly I found nothing at all about it on the Net. Hence we slowly waited, and waited......I even swung by a few times but there didn't seem to be much activity. Then I spied a mention in last month's Klue magazine about it. It sounded open and so inviting. However, being supercautious, I call on a Sunday but no open picks up the phone. Did the magazine get their opening hours wrong??? Anyway, last week, we took a chance. I'm glad we did, as we were pleasantly surprised. It had been a stressful day - no breakfast or lunch yet in our tummies even though it was already late, hence we were famished. We got a chance to redeem our breakfast - they were serving brekkie until 4pm since it was the weekends. The weekend special sounded good, with all the works including fruits but since we had to share that, we decided to go for one brekkie and one lunch item. Splashie Boy chose the Stacked Breakfast - eggs done sunny side up, beef sausage (or a choice of free range chicken sausage), rye bread, baked beans, mushrooms and something known as beef streaky. We totally loved the sausage - not easy to get good pork free versions in town but this one came close to the real thing. Juicy and well seasoned, it was excellent stuff. 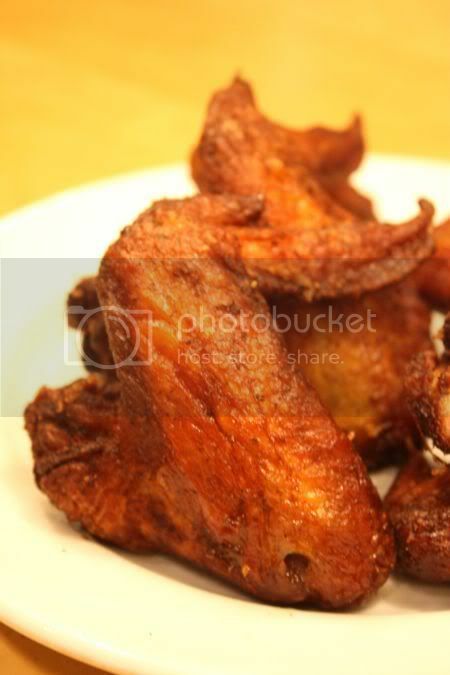 I liked the beef streaky, a crisp piece of beef that we kept eating up like bacon. Not as fragrant as the real stuff but much better compared to that limp stuff they call beef bacon. Needless to say, Splashie Boy polished up the food quickly. My lunchtime item was pasta - a not too big portion (but just right) of linguini tossed in a slightly creamy sauce with sundried tomatoes and roast chicken. Not overly rich, it was pretty good too. For dessert, we went for the stack of pancakes, something I was eyeing for breakfast. 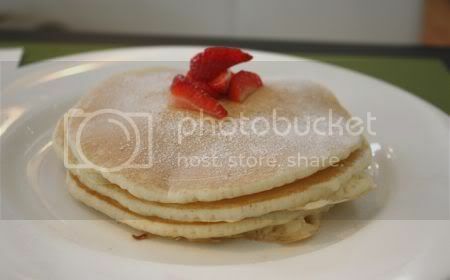 Nice and fluffy pancakes, which we ate drizzled with Heinz Breakfast Syrup. They also gave a very sweet blueberry syrup (I think), but I preferred the less sweet Breakfast syrup. There's something about pancakes that always reminds me of good old days in Chicago, where you can get great pancakes at the pancake houses there. On the way out, I spied some Magic Bars (RM4), which I grabbed one. No pictures as I was too busy eating it. Scrumptious stuff - a cross between Snickers and I reckon Bounty minus the chocolate coating, as it had peanuts, coconut, chocolate chips and breadcrumbs. A bit pricey though as it's quite small but after each heavenly mouthful, I didn't really care. 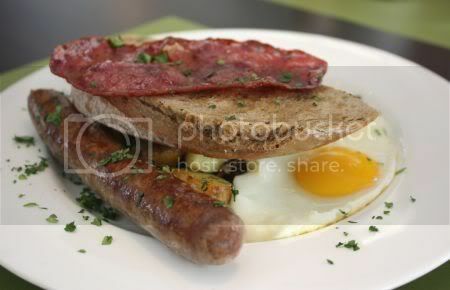 I reckon, we'll be coming back for more, especially breakfast and maybe that free range chicken sausage. By the way, no more posts for this week, I'm off for work up North again. Sigh, being on the road will not be fun but I do hope we get lucky with the eats this time round. I thought I'll end this week, with Japanese food - a new place I found last weekend. I have been eyeing this particular place for some time, but somehow, due to the lack of parking spaces (it faces SJMC hence parking is always a problem and if there is a function at the Sheraton Hotel nearby, it gets worst!). I finally managed to persuade Splashie Boy to give it a try one night and luckily, we managed to get parking quite easily. I have been curious to try this place as I heard pretty good comments about it plus, I wanted to see if they were the same people who used to have a Japanese restaurant on the 1st floor. I finally confirmed my suspicions, as they told me they had expanded their business. A quick look at the menu reconfirmed it too, as they are one of the few Japanese places that serves oden in town (the last time I dined here, I ate oden). We sat at the sushi bar - which was wide and quite spacey. Only problem is you can't really see much action as they put a bamboo stick on top of the counter, stuck with paper on their menu items. Nevertheless, it was still quite pleasant to sit there. 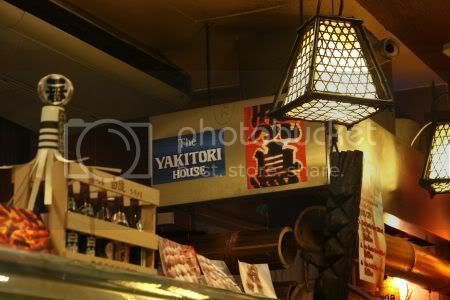 While, we sat there, I spied the Yakitori House at the side, hence I decided to order a few skewers. Unlike other places, the menu here is more varied with yakitori, oden mingled with Malaysian favourites of sashimi, sushi, teppanyaki and etc. While Splashie Boy ordered his Wagyu Beef Set (RM40++), I went for a varied selection of a bit here and there. 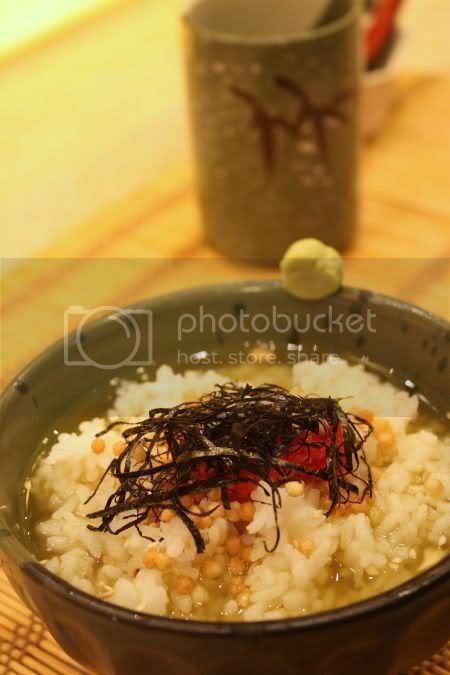 First was a Chazuke - rice topped with salted cod roe and mixed with green tea. 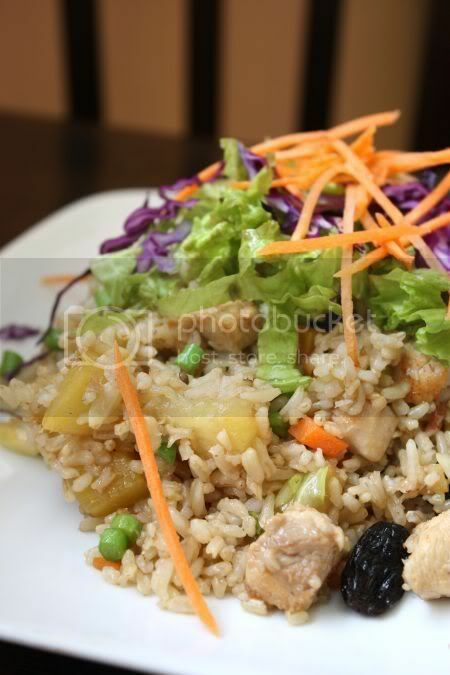 Nice and refreshing, it felt like eating "nasi air", since you mix everything together and eat it. Sorry, I can't really remember how much it costs (as I lost the receipt!) but it should have been in the region of RM10 to RM15++. 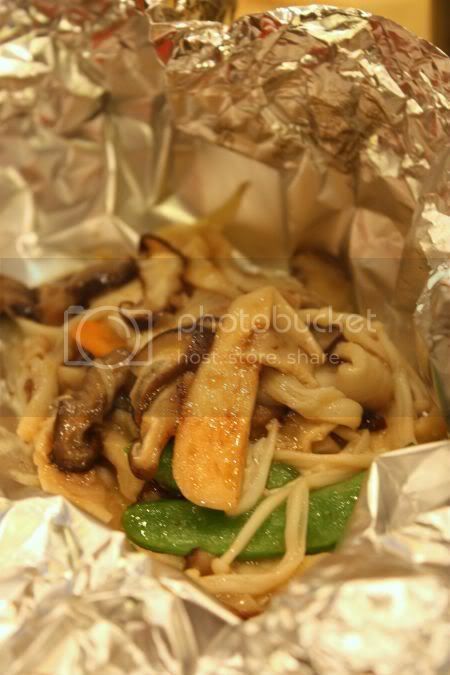 Next it was a yummy grilled mixed mushrooms served in a foil packet. Delish stuff, with enoki, eringi, shitake and a few vegetables all mixed up together. 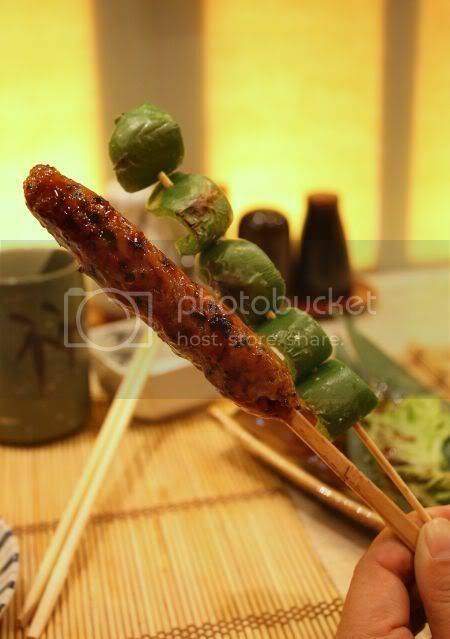 Next, they served my yakitori skewers - the Tsukune and Japanese green peppers. 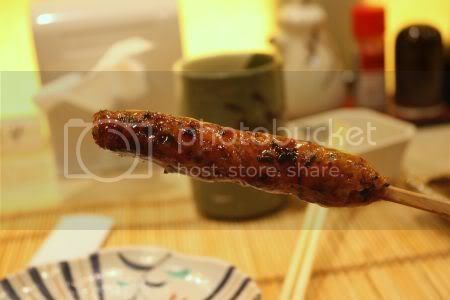 The tsukune - a kind of minced chicken wrapped round the skewer was excellent - smoky from the grill and really juicy. The minced chicken had bits of herbs to give loads of flavour. I'll definitely go back for more of this, as this was the best ever I tasted. The green peppers were okay, nothing fantastic but a nice light snack. Last but not least, Splashie Boy's set came. I didn't quite like the look of the meat mingling with the vegetables and topped with a garlicky sauce but he loved it. Once I scrapped away the garlicky sauce and ate the wagyu beef slice, I knew why he enjoyed it so much - the beef was tender. Great value for RM40 since it came with a full meal. Overall, I enjoyed my experience at Shun and it won't be my last time visiting here. 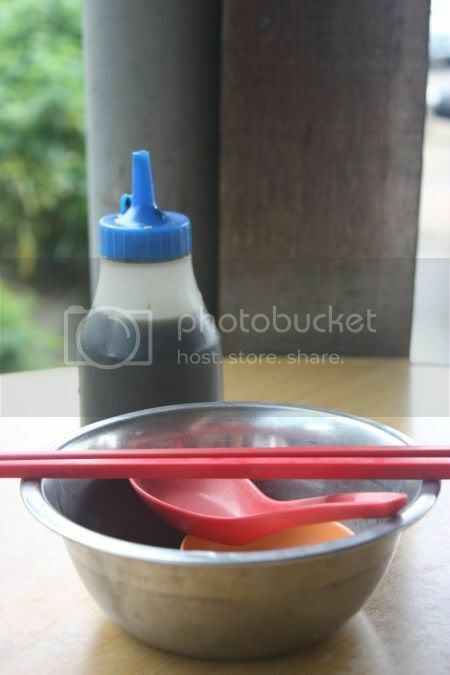 I'll probably come back and order oden, one of my favourites in Japanese cuisine - their version of yong tau foo. More skewers of tsukune will also be in the order. We also spied other specials on display - tuna carpaccio for RM15++. wagyu for reasonable prices. Definitely a good find to relish Japanese food. Now there's no need to drive up to Bidor for duck noodles - Pun Chun has opened an outlet at Kota Kemuning. Still a little far but definitely better than all the way to Bidor. Opened in May 2008, the place is a nice airy corner shop. Sadly you don't get the ever famous Wu Kok (Yam Puffs) but there's the signature dish - steamed duck soup with noodles, a concoction of roast duck leg steamed with ginger, Chinese herbs and longan. You have an option to have it dry or wet, as the steamed duck soup is cooked seperate. Also popular are the wantan noodles - I didn't get to try any as getting here especially early in the morning is quite difficult for me. However, quite a lot of patrons were eating it and it looked really good. 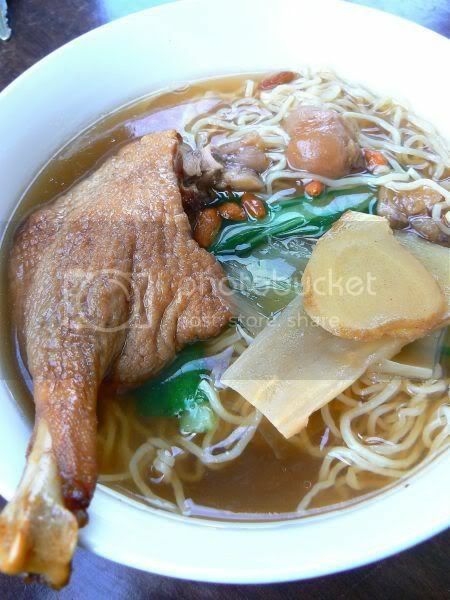 If the texture is the same as the noodles which were served with my duck noodles, they have to be nice and chewy. They also have toast bread with kaya, half boiled eggs, nasi lemak. Those who love their chicken biscuits and sat kei mah, will be happy to find out they have it at this shop. By the way, nothing related to Pun Chun but I just found out that Fukuya One Bangsar closed in mid-June and my favourite, Spicy Padang shop at Damansara Perdana also closed down. So sad, as those places served great food - lunch kaiseki sets at super duper prices and spicy padang dishes. Sigh! Don't worry though as Fukuya at Jalan Damai is still open, seems they had some dispute with the Bangsar owner, hence that outlet closed.